John Keppie, 1886; R A Bryden, 1905 additions to N. 2-storey, 5-section, roughly rectangular-plan villa with stepped frontage to W. Gabled and piend-roofed sections arranged from S to N as follows: piend-roofed block, advanced to W with octagonal turret at SW corner; piend-roofed section orientated N-S with balustraded timber porch to E and verandah to W with balcony above; gabled block, advanced to W with probably later 2-storey bay-window to W; early 20th century section, recessed to W; slightly lower piend-roofed section, recessed to W; Edwardian conservatory adjoining S elevation. Squared, snecked, stugged red sandstone with polished sandstone ashlar dressings. Non-continuous string cornice to W elevation; deep bracketed eaves with plain bargeboards. Raised quoin strips; raised, chamfered window margins; decorative half-timbering on gables to W.
E (ENTRANCE) ELEVATION: 2-leaf timber panelled folding door to large early 20th century timber porch with stained glass lights and balustraded parapet; tripartite mullioned window above with flanking basket-arched windows; gabled dormer to outer left; irregular fenestration elsewhere with a variety of window sizes. S (SIDE) ELEVATION: timber Edwardian conservatory with canted end on sandstone base; raised roof ridge; cast-iron finial. Gabled dormer at 1st floor to right. W (GARDEN) ELEVATION: Recessed section to centre with verandah/balcony in front supported on central decorative cast-iron post and scrolled stone corbels to sides; decorative cast-iron railings to balcony; 2 3-leaf folding timber panelled doors to verandah; 2-leaf glazed door to balcony with gabled dormer-head above. Advanced section to right with bipartite window at ground and 2-storey 3-light canted turret to outer right with ball-finialed octagonal piended roof. Advanced gable to left of centre with projecting 2-storey 3-light mullioned bay window. 2-bay recessed service wing to outer left with bipartite window at ground and basket-arched windows at 1st floor. Timber sash and case windows with a variety of glazing patterns: plate glass to principal rooms on W elevation; 4-pane glazing to less prominent windows; border-glazed stained glass windows and some small-pane glazing to E. Corniced red sandstone stacks with decorative red clay cans. Graded grey slate roof. Cast-iron rainwater goods. INTERIOR: half-glazed timber panelled doors to inner lobby and entrance hall. Entrance hall panelled to dado; Mackintosh-style stained glass; timber chimneypiece with bevelled glass mirror in timber frame above; dentiled timber over-doors. Timber staircase with plain balusters rising to galleried 1st floor landing. Timber chimneypiece to drawing room with Adam-style decoration and matching cast-iron grate; picture rail; Adam-style wall and ceiling friezes; compartmented ceiling. Sitting room with working timber shutters and plain marble chimneypiece. Adam-style chimneypiece to dining room with plain cast-iron grate; decorative ceiling frieze and compartmented ceiling. Some original pantry cupboards in kitchen. Timber panelled doors throughout; brass handles downstairs; timber knobs upstairs. Plain cornicing throughout. BOUNDARY WALL, RAILINGS AND GATEPIERS: dwarf boundary wall; intermittently-space piers linked with cast-iron railings; ashlar gatepiers inscribed 'OAKHILL' in small roll-moulded panels. GARDEN TERRACES AND STEPS: garden terraces with sandstone steps to front and side of house. GARAGE: circa 1930. Rendered garage with half-glazed timber-boarded folding doors, bargeboarded entrance gable; depressed-arch windows to sides. A good late Victorian villa, occupying a relatively prominent position on Montgomerie Terrace, by the architect John Keppie who also designed the two houses to the North. This is the best of the three. Keppie later joined practice with John Honeyman, who had a house in Skelmorlie and also designed a large numbers of villas there. Oakhill was considerably extended by the architect Robert Bryden in 1905. These additions not only include the service wing, conservatory and porch, but also additions to the SW corner of the house, which are not so easy to identify. It seems that the house was considerably altered at this time and the stained glass and Adam-style decoration almost certainly date from this time. The interior of the house is particularly good, especially the half-panelled entrance hall with its galleried first-floor landing. 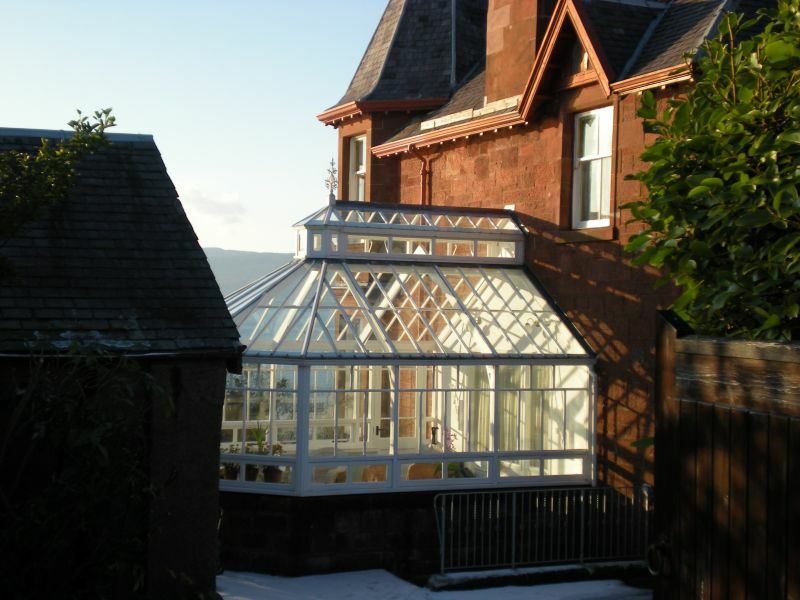 The early twentieth century conservatory is a rare survival in Skelmorlie, although its condition is rather unsound.